Ok, so this isn't really lasagna at all... but it certainly tastes incredible! There are no noodles in this lasagna. Instead it's made from stale bread. I've been making a lot bread machine bread lately, and we never seem to be able to finish the loaf before it goes stale. All you do is place a layer of stale bread at the bottom of a casserole dish. 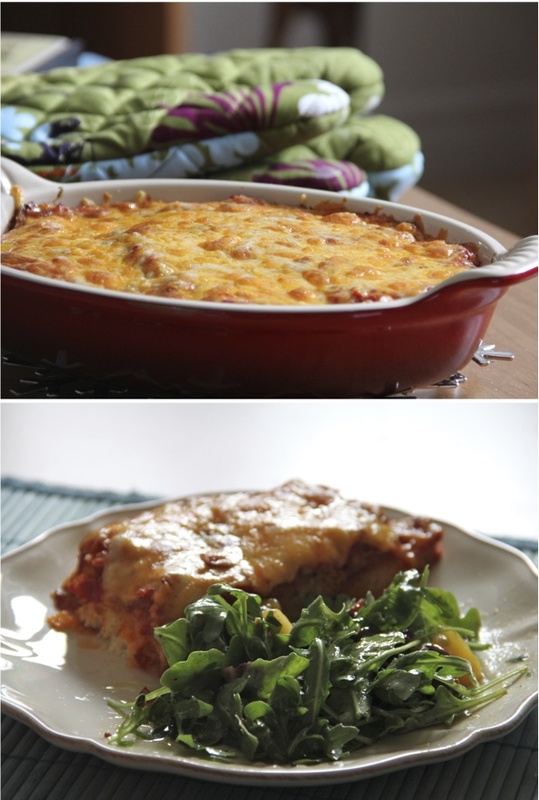 Cover with a thick layer of tomato sauce and top with a mixture of cheddar and parmesan cheese. Bake at 350 for 20 minutes, then broil for 3 minutes until the cheese starts to brown & bubble. I'm telling you, this is delicious! 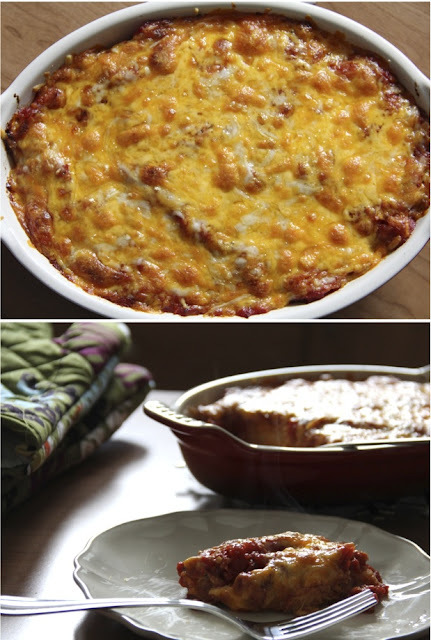 You can get real creative and make layers, add pan-fried mushrooms or meat if you like. This sounds like such a good idea. I usually make bread crumbs with stale bread, but this would be delicious! You've taken that to an entirely new level! Love it. wow never heard of making lasagna this way...pretty cool since you have all that bread. you make bread at home...you rock lady..gosh it must be so delicious straight out of the oven. This is so smart and it looks and sounds so delicious. Thanks for sharing! i love simple meals. this looks great! how very sneaky! i, too, love kitchen experiments. i just found your blog by way of express-o, and like your stuff. i also read your post about rainy days. aren't they just the best?